British designer Tom Dixon has opened a new flagship store, showroom and offices inside a Victorian coal yard in London's King's Cross. The brand has relocated its entire operation from Ladbroke Grove in west London to a group of Victorian buildings in King's Cross. The transformation of the building forms part of the redevelopment of the area around the major transport hub in the north of the capital. Named the Coal Office, the 1,625-square-metre complex curves alongside the Regent's Canal near the Thomas Heatherwick-designed Coal Drops Yard shopping centre, which is due to complete in October 2018. 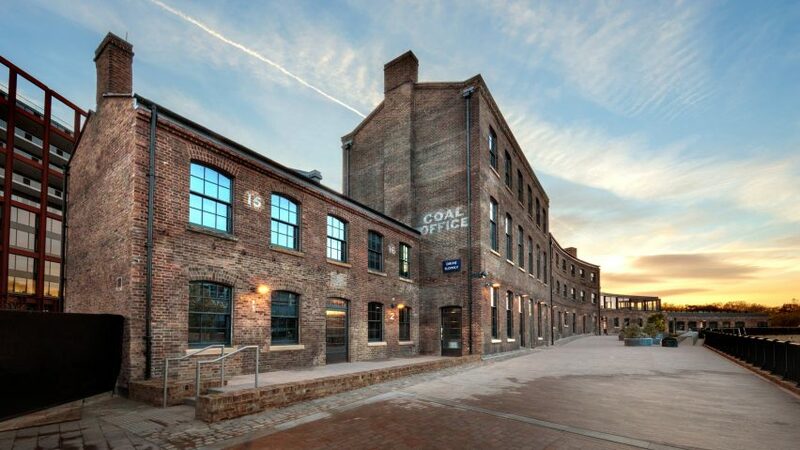 The Victorian buildings contain offices for the brand's staff and a gallery, while the flagship store and showroom is located in seven railway arches beneath them. The shop opens on the 20 April 2018, with an onsite restaurant and cafe scheduled to open in June. "It was time to try something new, but it was difficult to find somewhere that allows us to have the right mix of professional and retail – King's Cross gives us that," Dixon told Dezeen. "Connectivity was also the other factor [for the move]. From King's Cross you can get to the rest of the UK, straight to Edinburgh, Newcastle or Margate, and in the other direction Europe," continued Dixon. "I say that a brand is only as good as its network, whether it is on Instagram or with its premises." Dating back to 1851 the Coal Office buildings, along with Coal Drops Yard, were the hub for the distribution of coal around London. The buildings were refurbished by David Morley Architects before Tom Dixon's studio took over the project to design the interiors. Inside, brick walls have been left exposed and paired with patches of pale and coal-black wooden parquet. The spaces are dressed with furniture and lighting by Dixon's brand. "The infrastructure was in place when we got the building, but it had been lying fallow for a couple of years. We're finishing it and making it make sense," said Dixon. Along with the new flagship store Dixon recently opened stores in in Los Angeles and New York. He believes that a physical presence remains important in the digital age. "We are just as interested in the digital world, but we have found that the digital works better in combination with a physical location," said Dixon. The building will also allow the studio to continue to operate an onsite restaurant – like at Dixon's previous premises – and begin to manufacture onsite in a building that Dixon wants to evolve over time. "We need a great place for our people to work, and go beyond design," he said. "I'm very interested in how food fits with design and I want a place to start manufacturing things again, like I did when I started." "I see the building as being at the beginning of an adventure rather than a fait accompli. I see the building evolving very quickly. I want to open up the building more, to open up our design, prototyping and interiors processes," he added. Tom Dixon is hosting an open house for architects, designers, decorators and stylists to explore his new collection and space on 10 May 2018. The area around King's Cross station is currently undergoing extensive redevelopment. Central Saint Martins art college opened its doors in a granary renovated by Stanton Williams in 2011, while an extension to the station designed by John McAslan + Partners opened in 2012. The site is still developing with Wilkinson Eyre recently completing a residential building inside a trio of Victorian gasholders, and both Facebook and Google planning to build headquarters in the new district. For job opportunities at Tom Dixon, visit their company profile on Dezeen Jobs.